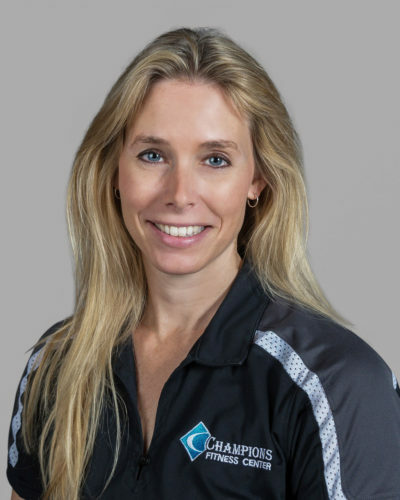 Hello, my name is Traci Melvin Ezzo and I am a group fitness instructor and personal trainer at Champions Fitness Center. I graduated from SUNY Cortland with a degree in Physical Education with a concentration in Adult Fitness Programming. My interest in fitness started at a young age as a competitive gymnast. After my gymnastics career ended due to an injury, I began working out to stay in shape and eventually competed in several fitness pageants. For over 20 years now, I have been teaching group exercise classes and doing personal training. I am currently certified thru ACE (American Council on Exercise). I specialize in teaching Spin, Bootcamp, Strength Training and Pilates classes. As a personal trainer I strive to help people achieve their goals! If I can push someone to do more than they ever thought possible, their self- esteem, confidence, and quality of life both physically and mentally will improve.